Indonesia earthquake, tsunami highlights: The death toll has risen to 844, but authorities have warned that it is likely to climb much higher. Here is the latest news. 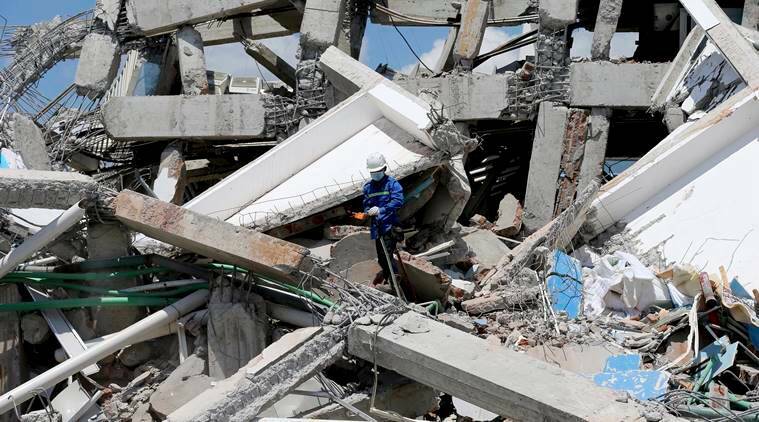 Indonesia is preparing a mass grave to bury its dead in the aftermath of the deadly 7.5-magnitude earthquake, which triggered a tsunami in Palu last week. For health and religious reasons, 300 bodies, which have been identified, will be initially buried. As death toll rose to 844 on Monday, officials warned that it is likely to climb much higher. Most casualties are from Palu, as the situation in outlying areas like Donggala, Sigi and Parigi Moutong, is yet to be ascertained. Indonesian President Joko Widodo, who visited the region over the weekend, said there are many challenges hampering rescue efforts. “We have to do many things soon, but the condition does not allow us to do so,” he was quoted as saying by The Associated Press. Palu has a population of 3,80,000 people, while the outlying areas comprise 1.2 million residents. A 7.5-magnitude earthquake struck the coast of Sulawesi island on Friday evening, which is about 50 miles north of Palu. It triggered waves as high as six metres (20 feet), which bore down on the city destroying everything in its path and killing hundreds. Indonesia quake, tsunami Highlights: Death toll in Palu rises to over 800. Reuters quoted witnesses as saying that queues at petrol stations stretched for kilometres. Convoys carrying food, water and fuel awaited police escorts to prevent pilfering before heading towards the city. One aid worker spoke of growing lawlessness and threats of violence among survivors seeking fuel. The state energy company said it was airlifting in 4,000 litres of fuel, while Indonesia's logistics agency said it would send hundreds of tonnes of rice. The government has allocated $37.58 million for the recovery. The death toll has risen to 844, the national disaster spokesperson says, reports AP. Officials are still struggling to access outlying areas of Sulawesi island, which means the toll is likely to be higher. News from these regions is coming in, however, including the death of 34 children at a Christian study camp, reports Reuters. "The evacuation is not finished yet, there are many places where the evacuation couldn't be done because of the absence of heavy equipment, but last night equipment started to arrive," Widodo was quoted as saying by Reuters. Here's a look at the aftermath of the tsunami. Over 800 people are dead, and the toll is likely to rise. Indonesia quake, tsunami: What happened to warning systems? Indonesia is prone to earthquakes and tsunamis. In 2004 the country witnessed a deadly tsunami that killed over 120,000. So doesn't it have a warning system? Yes, it does. Officials are saying that a warning was issued after the quake, but lifted half an hour later because they thought the waves had already hit, reports Reuters. The waves hit the island 34 minutes after the quake. According to a report in New York Times, meanwhile, scientists are surprised at the extent of the damage. Several countries have already offered Indonesia assistance, including the UK, Australia, Thailand and China. The country has appealed for more aid, as it struggles with basic necessities like food, electricity and fuel. Communication lines have been down in the wake of the tragedy as well. 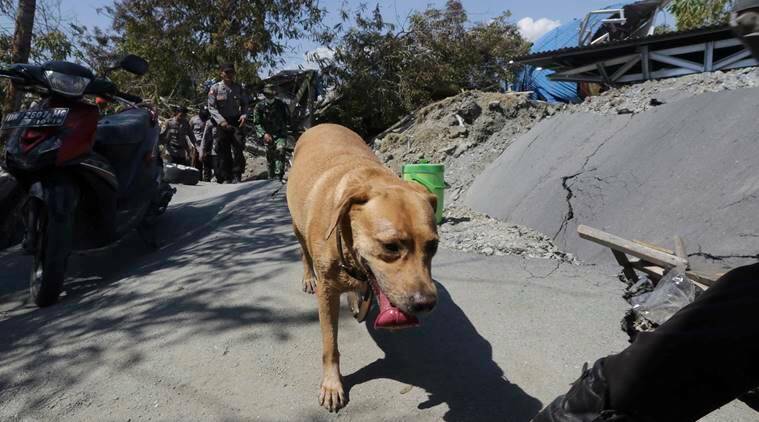 More than 560 prisoners have escaped from Palu's prison after its walls caved in during the earthquake, reported Reuters. The warden was quoted by the agency as saying, "It was very hard for the guards to stop the inmates from running away as they were so panicked and had to save themselves too." In Donggala too, over a hundred inmates have reportedly fled. According to Guardian, 1,425 prisoners are missing from jails. Some key spots where rescue operations are underway, include Rao Rao Hotel, where at least 60 people are likely to be trapped and Tatura Mall. A woman was pulled out of the debris alive from the hotel on Sunday. The government has declared a 14-day state of emergency in Sulawesi Island, which is one of Indonesia's five main islands. Majority of the population in the country, and on island, is Muslim with pockets of Christians. There are 3,80,000 people residing in Palu, which there are 1.2 million people in Donggala, Sigi and Parigi Moutong. The death toll rose on Sunday to 832. Authorities are expected to provide an official update on the situation, including rescue efforts, shortly. Due to health and religious reasons, authorities are digging a mass grave in Palu which can hold 300 bodies. The bodies which have been identified will be buried "as soon as possible", the chief of the country's National Disaster Mitigation Agency said, reported AP. 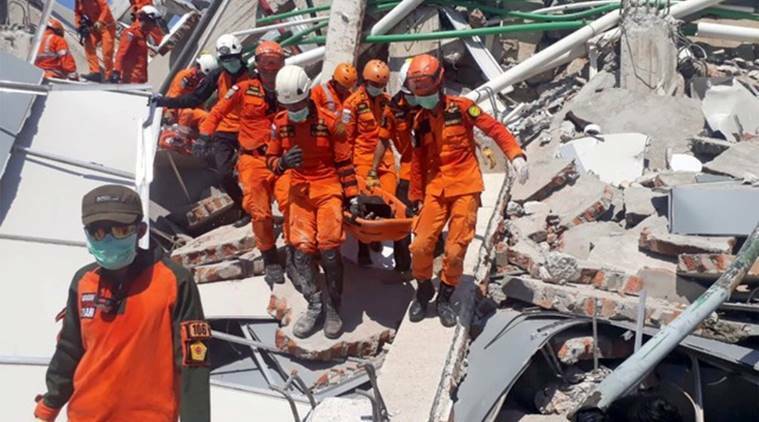 Most bodies have been recovered from Palu, as communication lines have been down hampering rescue efforts in outlying areas. Indonesia: Where was the earthquake, tsunami? An earthquake measuring 7.5 on the Richter scale hit the Indonesian island of Sulawesi on the evening of September 28. The coast was hit by a tsunami around 30 minutes later. 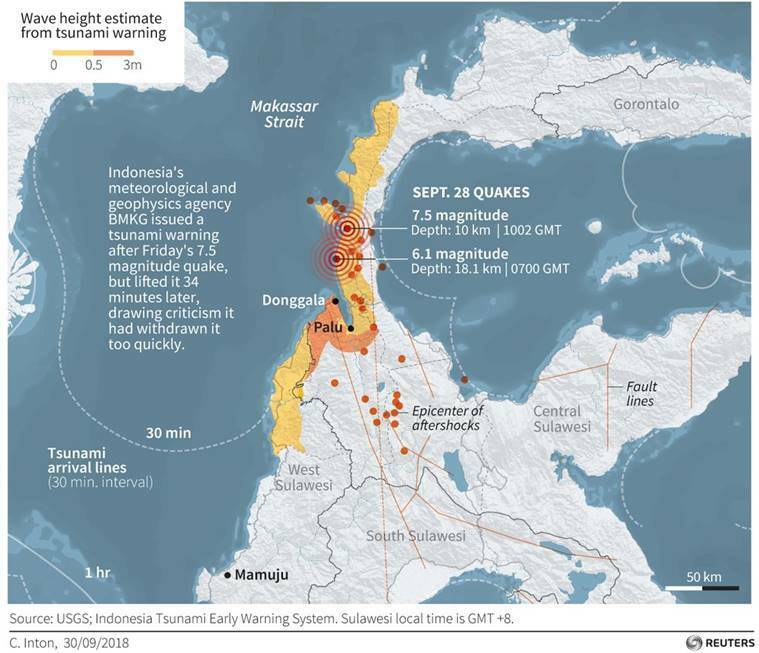 The Reuters map below shows the epicentre of the quake and the tsunami arrival lines. You can see how close Palu, among the most affected, is from the epicentre as well as the outlying areas of Donggala, Sigi and Parigi Moutong. A tsunami, also called a seismic sea wave, is a series of long, high waves caused by an earthquake or undersea volcanic eruptions. The speed and height of the waves depend on the depth of the ocean. They travel really fast and slow down only while reaching the coast. A 7.5-magnitude earthquake struck the coast of Sulawesi Island in Indonesia on Friday morning, triggering a deadly tsunami. The toll crossed 800 in Sunday as authorities scrambled to search for survivors. Follow our live blog through the day as we bring you the latest news and updates. Indonesia is prone to earthquakes and tsunamis. The 2004 tsunami was triggered by an 9.1-magnitude earthquake in Sumatra, which killed 120,000 people in Indonesia. The Associated Press reports that a tsunami warning was issued 34 minutes after it struck Palu — officials say the warning was in force as the waves hit. Meanwhile, according to report in New York Times, experts are surprised at the size of the tsunami. They add that a calamity of this scale is likely to help scientists learn more about quakes and tsunamis. Several countries have offered to help Indonesia, including the UK, Australia, Thailand and China. The European Union has announced immediate aid of 1.5 million euros.